This post is the second in a five-part series (I. Projection, II. Base Maps, III. Color Selection, IV. Symbology, and V. Legends) which will look at various GIS tools and methodologies utilized by Stratasan. In this second entry we will discuss our uses for different base map layers in our GIS-based products. Base maps are just that, the base layer that all other features are drawn over. The selection of a base map depends on the purpose of the map and what it needs to visualize. What combination of patients, hospital service areas, and other various healthcare attributes will be placed over it? Does the customer need to see political boundaries, bodies of water, roads, cities, and/or topography? Should the map features have color? Do these features need to be labeled? These are just some of the criteria that we address when choosing base maps for our customers. In the end, the one we choose is contingent on the purpose of that map and the preferences of our customers. 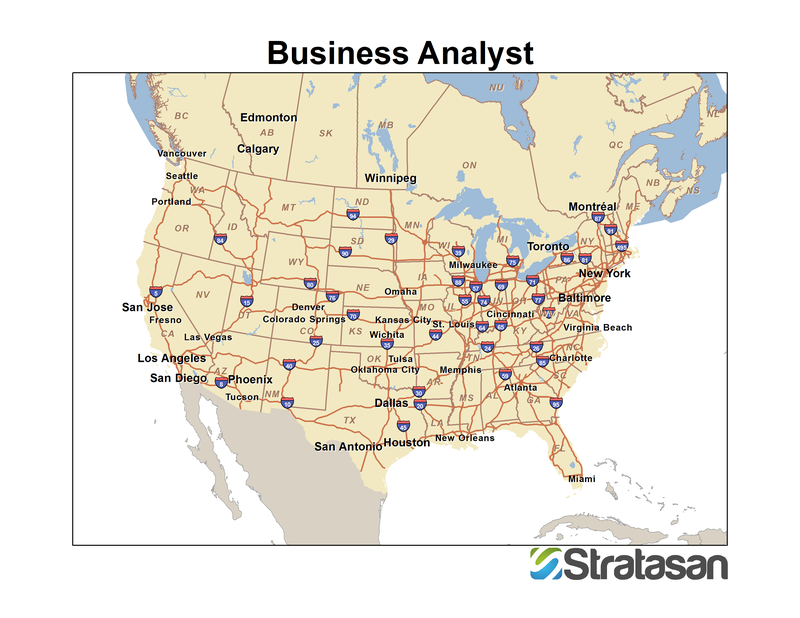 The Business Analyst base map has a neutral tan background and shows major roadways, political boundaries, metropolitan areas, and parks. Depending on the scale the map is zoomed into; various state, county, and other political boundaries turn on and off automatically. The most important part of the Business Analyst base map is that it interacts with the rest of the Business Analyst tools. 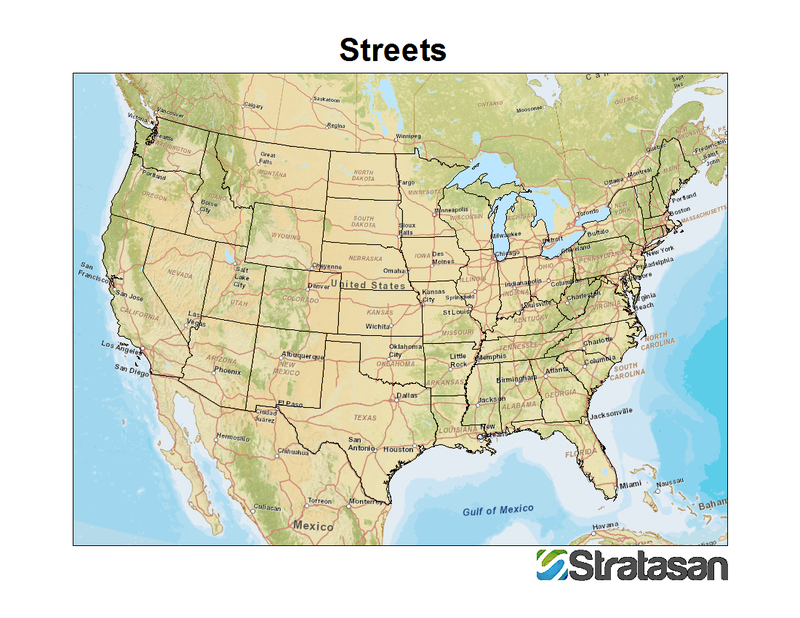 This integration allows the Stratasan GIS team to geocode patient data, run detailed analysis on patient-based hospital market service areas, and provide our customers with the best psychographic information available. The Streets base map layer is useful because it displays roads and political boundaries as well as physical geography such as mountains, plains, and bodies of water of all sizes. This combination makes it a great base layer for areas where political boundaries and the local environment are important (such as facilities next to lakes and rivers with limited crossings or areas separated by mountains). This is valuable when it is important for the map reader to understand the lay of the land or if the customer would like their maps to be aesthetically pleasing. The Physical and Ocean base map layer has all the advantages of the Streets base map without the cluttering of political boundaries and labels. This gives layers placed on top of it a cleaner look. Another advantage is that the only labels that appear in a Physical and Ocean base map are placed there on purpose by the Stratasan GIS team. Colors of the terrain also help the user look at general topography in both micro and macro views of the US, states, and cities. The Shaded Relief map, my personal favorite, shows terrain in grey-scale and displays bodies of water in a uniform light blue color. 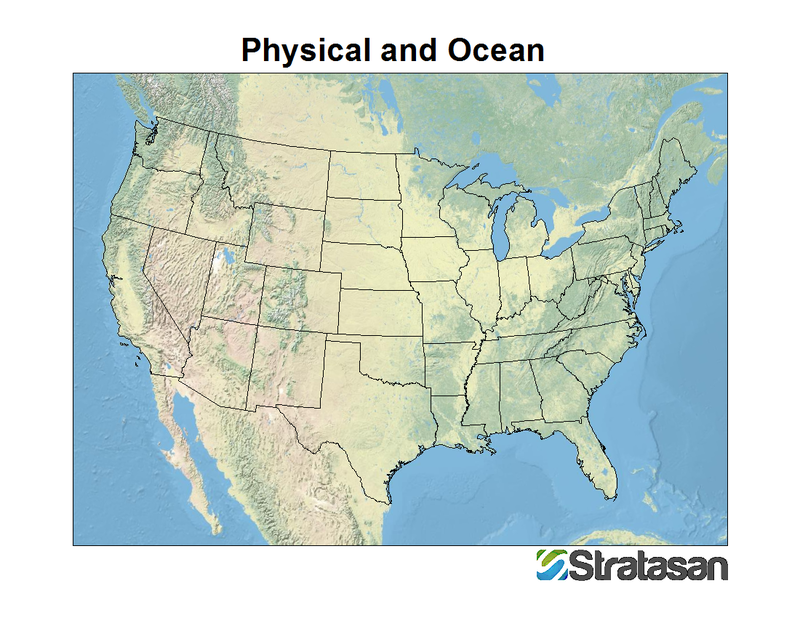 It is a crisp map and helps accent many of Stratasan's products without cluttering the background with terrain colors, various political boundaries, or labels. The Shaded Relief base map maintains this clean and sharp look at all scale levels and serves as a great backdrop for point, line, and polygon features that we utilize in our healthcare mapping, market briefs, development briefs, and our Community Health Needs Assessment. This base layer also shows the person viewing the map the lay of the land in great detail, especially in regards to elevations and the locations and sizes of almost all bodies of water. 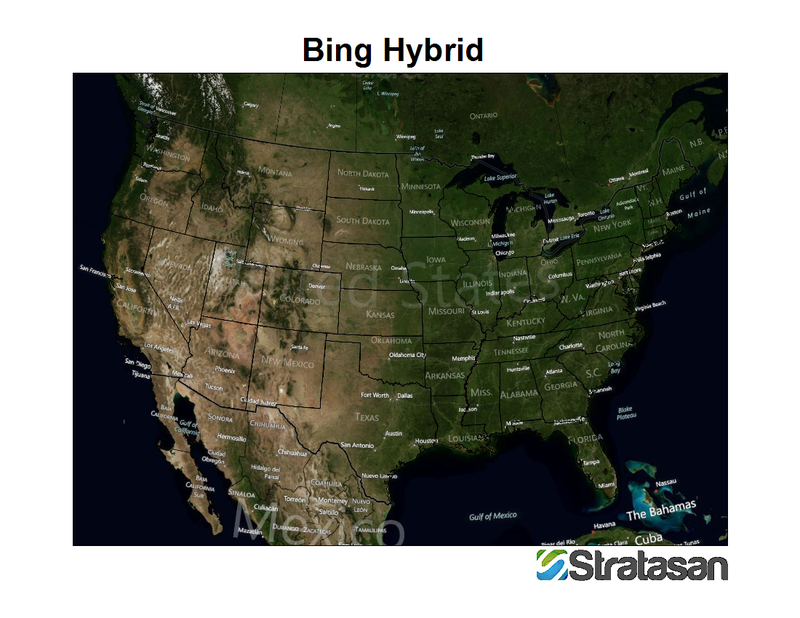 The Bing Hybrid base map is a combination of Bing's satellite imagery mapping, political boundaries, and labels placed on top of them. This base map is useful in larger geographies (US, States, or large regions), but in smaller views it can get cluttered quickly with roads and buildings. Any map with this level of detail always runs the hazard of being too busy, and the Bing Hybrid base map is no exception. However, it is a great base layer for maps of large areas with very little data in them (such as a selection of hospitals in a state or region). The base maps we use at Stratsan are not the definitive collection of available base layers. However, we believe that a balance of customer input and aesthetic qualities is important. Different base maps work better for certain situations and presentations, and we are aware of it. Our goal is for our customers to receive the best maps possible that inform and display the best available data. We will continue to utilize new base maps and keep track of the ones that have worked well in the past. All possible base map options are considered when we make cartographic decisions, and our GIS department is always on the lookout for new base layers that look great and help present our products in the best way possible. Bad Maps, Bad Maps, What’cha Gonna Do?